Ahhh the good old days. The more things have changed, the more Chris O'Sullivan wished they'd stayed the same. The former Canberra Raiders half isn't a fan of the modern game. Doesn't watch it any more. Doesn't like what it's become. The way it's played. Liked the way it was. Back when he was playing for the mighty Green Machine. Winning back-to-back premierships wearing the No.6 on his back alongside current Canberra coach Ricky Stuart. He tried to watch the other week, when he blew the Viking horn before a Raiders game. He tried. But he did enjoy being around the modern crop. Talking footy. Passing on some wisdom to Sam Williams. Hoping they can emulate what he achieved 30 years ago, when the Green Machine stormed to their maiden premiership. He knows they've started well. Their four wins from five has them sitting near the top of the NRL table, ahead of their clash against the Brisbane Broncos at Canberra Stadium on Sunday. It's a field O'Sullivan knows well, having played about a quarter of his career there after the Raiders' switch from Seiffert Oval. O'Sullivan was one of the first 14 inductees into the Raiders hall of fame earlier this year. The 202-game's career coming to a close a couple of years after the back-to-back triumph. "I did speak to them the other night, but I didn't watch them play," he said. "I was giving them a little bit of advice. I think Sam kicks the ball a bit. I said to him, 'Well don't kick it if you can't compete for it. Just remember that'. "But I wish them all the best. Because they've changed [the game] so much you lose a bit of interest and become disappointed." The structure. The kicking to corners and playing the percentages. The death of the shoulder charge. And the chip and chase. Not taking advantage of the scrum. The lack of competition at the scrum and the play-the-ball. These all stick in O'Sullivan's craw. But that doesn't mean the modern players aren't good footballers. Just thinks the old game couldn't have been that bad. With a coupla rich kids fighting to control it. Piece by piece, Canberra Raiders five-eighth Jack Wighton is expanding his bag of tricks - with the help with one of the best playmakers the game's ever had. Raiders coach Ricky Stuart said Wighton was still a work in progress, but would start to feel completely comfortable over the final rounds of their season. As Wighton improves, so will his combination with the Green Machine's spine - which was starting to click ahead of their crucial clash against the Brisbane Broncos at Canberra Stadium on Easter Sunday. 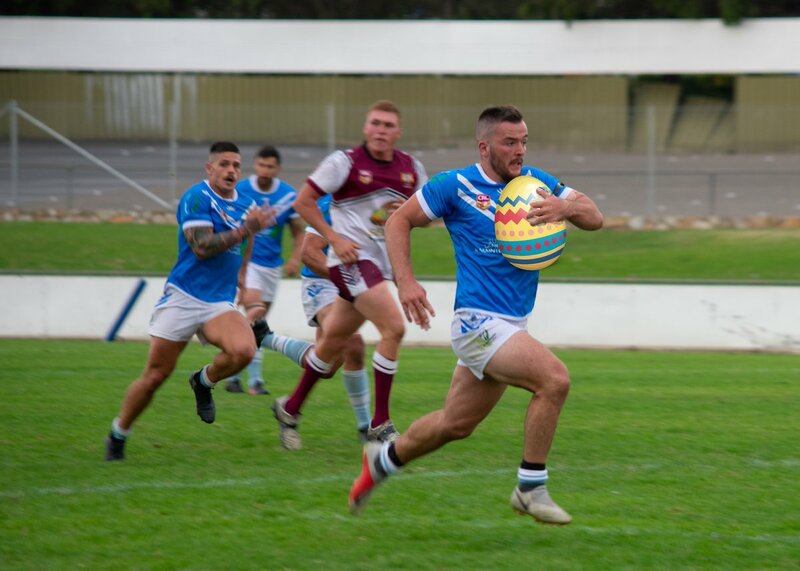 Cotric wants to capitalise on the Raiders' red-hot start to the NRL season and force his way into the NSW State of Origin team. JJ Collins will never forget the sound of his mother in tears on the other end of the phone. But they were flowing for good reason. They were tears of joy, tears of pride, tears brought on by a letter Collins' brother was supposed to hide. His mother Suinu'u had stumbled upon a letter addressed to her son back home in Logan. It was the name that got her - instead of "Felise", the last name read "Collins". Canberra flyer Nick Cotric wants to capitalise on the Raiders&apos; red-hot start to the NRL season and force his way into the NSW State of Origin team. The 4-1 Raiders are pushing for their best start to a campaign since 2003 when they host an underperforming 1-4 Brisbane at Canberra Stadium on Sunday. Cotric, 20, has scored 29 tries in 53 appearances and been in Brad Fittler&apos;s Blues squad since last season, but is yet to make his Origin debut. They used to be the Raiders' leaky right edge, but a renewed defensive resolve has them setting their sights on stopping the Brisbane Broncos sow their Oates. The Canberra Raiders are chasing their third straight win when they take on the Broncos at Canberra Stadium on Easter Sunday, which would end a six-game losing streak against the visitors in the process.